The Columbia team beat teams from Purdue and Georgia Tech to take home first prize in the low noise subsonic category at NASA’s Langley Advanced Air Vehicles Challenge. 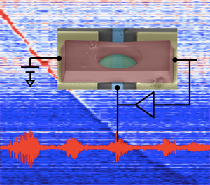 In this new study, the team took advantage of graphene’s mechanical ‘stretchability’ to tune the output frequency of their custom oscillator, creating a nanomechanical version of an electronic component known as a voltage controlled oscillator (VCO). At the 2017 Faculty Excellence Celebration, five of our esteemed professors were recognized with awards and honors received during the past year. Honors include the Milton C. Shaw Manufacturing Research Medalin, Machine Design Award, Mechanisms and Robotics Award, H.R. Lissner Medal, Society of Engineering Sciences’ (SES) Engineering Science Medal and Y.C. Fung Young Investigator Award . Find out who was recognized!